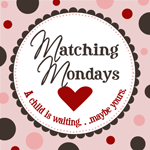 I'm tak­ing the "Match­ing Mon­day Challenge!" "I have been doing Match­ing Mon­days for many months now.More peo­ple fea­tur­ing wait­ing chil­dren means more peo­ple will be see­ing­wait­ing chil­dren and hope­fully more hearts will be changed, minds will be enlight­ened and more matches will be made. This is some­thing rel­a­tively easy that you can do to sup­port adoption. I hope you will join me in this effort! I encour­age YOU to become an advo­cate of wait­ing chil­dren by look­ing through your own states wait­ing chil­dren web­sites and choose one or two each Mon­day to fea­ture on your blog. Give these chil­dren and all wait­ing chil­dren more pos­i­tive exposure. Help change hearts and minds by allow­ing peo­ple to see who is really wait­ing for a family...break stereotypes. Help cou­ples and chil­dren come together. I have been think­ing of what else can be done with Match­ing Mon­days to help in these three goals move for­ward. After pon­der­ing on this topic, I decided that I need to recruit peo­ple to fea­ture wait­ing chil­dren on their own blogs. It seems that in many cases it is a lit­tle eas­ier to adopt chil­dren wait­ing in your own state." I think I made some good picks! Lit­tle­john is described as very active, talk­a­tive, and has a "wild imag­i­na­tion." Lit­tle­john likes play­ing bas­ket­ball, video games, and foot­ball. He also enjoys art and swim­ming. Littlejohn's favorite pos­ses­sions are his Lego's..
Lit­tle­john is age appro­pri­ate in both height and weight and he is able to com­plete per­sonal hygiene tasks with­out assis­tance. Things that make Lit­tle­john happy is hav­ing a good rela­tion­ship with his sis­ter, swim­ming, and going on field trips. Lit­tle­john has a good appetite and enjoys a vari­ety of foods. Lit­tle­john needs a fam­ily who can pro­vide him love, struc­ture, and rou­tine. He will do well with a fam­ily who loves him dearly and can meet his need. Lit­tle­john is tribal and ICWA applies to the case, but there has been a good cause hear­ing so that all fam­i­lies can be considered. Mona is an 18-year-old girl from Texas who is hop­ing to be adopted. Mona is an adven­tur­ous teen who loves to have fun. She is spon­ta­neous and easy to get along with. She has a great sense of humor and tends to be sar­cas­tic at times. Mona loves to be on the go and involved in dif­fer­ent activ­i­ties. A very social teen, Mona has many friends. She also likes to keep up with the hottest trends in fash­ion and music. She loves her iPod and always has it with her. Mona will eat just about any­thing but really likes spaghetti, jam­bal­aya and chicken. Mona is a very encour­ag­ing teen. She loves to dance, draw and play sports. She is a great role model to younger chil­dren and just loves to have fun. Mona is cur­rently work­ing on improv­ing her grades in school and becom­ing more organized. Mona and Joe are very bonded and get along great with each other. They think about each other in every deci­sion they make and spend a lot of time together. Mona and Joe really want to be adopted! Mona is an adven­tur­ous teen who loves to have fun. She is spon­ta­neous and easy to get along with. She has a great sense of humor and tends to be sar­cas­tic at times. Mona loves to be on the go and involved in dif­fer­ent activ­i­ties. Joe is very out­go­ing and excels in ath­let­ics. He plays foot­ball, bas­ket­ball and runs track for his school. He loves being out­doors and try­ing new things. He also is a great artist. Visit us at the San Anto­nio Heart Gallery. Visit us at the TARE Gallery. Mona wants a fam­ily who likes to spend time together and is active. She wants an adven­tur­ous fam­ily who likes to be out of the house and go dif­fer­ent places. Mona is okay with hav­ing other chil­dren in the home as long as she can have her own room. She needs a fam­ily who will be sup­port­ive of her in the deci­sions she makes and will guide her through her future. Mona has two broth­ers, one that is a part of this adop­tion and the other with whom she would like to remain in con­tact with. Prince is a 1-year-old boy from Texas who is hop­ing to be adopted. Prince is an easy-going baby who enjoys affec­tion. He often smiles and enjoys engag­ing in play with adults and with other chil­dren. Prince is diag­nosed with Sen­sory Inte­gra­tion Issues. He was eval­u­ated by the Early Child­hood Inter­ven­tion (ECI) and they felt he became over­stim­u­lated by the out­doors. It is felt that he will over­come these issues through therapy. Fadia, Prince, and David have a close rela­tion­ship. They enjoy being in each other's com­pany and play­ing together. Fadia is a very talk­a­tive and ener­getic youth who is fun to be around. David is a sweet, affec­tion­ate child who can be shy at first. Prince is an easy-going baby who enjoys affec­tion. They always warmly greet one another and are insep­a­ra­ble. They have their occa­sional con­flicts, but make no mis­take, they love and care for one another. Visit us at the TARE Gallery. Prince needs to be placed with a fam­ily who can pro­vide him with love and nur­tu­rance and help pro­mote his deveo­pl­men­tal growth. It is impor­tant that his fam­ily be edu­cated about the chal­lenges that he may face later in life. Shar­day is a 14-year-old girl from Texas who is hop­ing to be adopted. Shar­day is very quiet and shy; how­ever, once she becomes com­fort­able with a per­son she can be very open and will talk for­ever. Shar­day enjoys writ­ing and being on the com­puter, she also enjoys play­ing bas­ket­ball. She loves to draw and be engaged in activ­i­ties with oth­ers. She will share, but only when she decides. Shar­day is very pro­tec­tive of her­self, space, and belong­ings. She can have episodes when she gets sad. Shar­day does fairly well in her classes, but can excel with encour­age­ment and extra sup­port. She strug­gles a lit­tle bit in read­ing. Shar­day receives extra help both at school and in her fos­ter home. Sharday's case­worker reports she is a well adjusted youth, that will tell you how she feels and knows how to express her feel­ings pos­i­tively. Shar­day is mind­ful of her actions and will accept respon­si­b­lity to cor­rect them. Sharday's fos­ter mother says she is doing very well. She helps oth­ers and will vol­un­teer to do more if some­one else is unable to do it. Fos­ter mother adds that Shar­day is a good lis­tener and likes to ask a lot of ques­tions because she is very curi­ous. Visit me at the TARE Gallery. Shar­day is a very lov­ing girl who is seek­ing sta­bil­ity in her life. She needs a fam­ily that is very lov­ing, car­ing and sen­si­tive to her emo­tions. She needs a fam­ily that is will­ing to work with her and spend qual­ity time with her.